Varicose veins are problematic in that not only are they painful, but the twisted, swollen mass of veins are not very pretty to look at. This may seem like a serious, hard to treat problem, however, the problem of varicose veins can usually be reversed with preventative measures and simple home remedies. Veins exist to flow blood to and from the heart. However, when blood circulation is poor and blood starts to build up in the veins, causing the veins to become weak, bulge, and twist. Varicose veins can occur anywhere on your body, but they most commonly occur in the legs. Varicose veins occur when the veins are under a significant amount of pressure and become weak. This can be the result of a wide variety of reasons such as poor circulation, weight gain, pregnancy or an injury. Varicose veins can also be caused by constipation, not drinking enough water, wearing high heals or unsupportive shoes, wearing constricting clothing, constipation, exposure to extreme temperatures, and not getting enough exercise. Used on their own or with other treatments, essential oils are an effective treatment for getting rid of varicose veins. This anti-inflammatory essential oil is great for not only calming down inflamed tissue, but for promoting blood circulation as well. Since the root cause of varicose veins is poor circulation, this essential oil gets everything back in working order, helping to alleviate existing varicose veins and preventing the development of new ones from occurring. You will often find chamomile essential oil on the top of many lists for healing various health ailments and for good reason. This magic essential oil encourages a healthy response to inflammation and promotes healthy circulation. The cherry on the cake is that chamomile essential oil also helps promote healthy blood vessel constriction. This refreshing oil has a number of benefits, from calming the mind to deflating angry, bulging veins. Cypress essential oil is an anti-inflammatory and improves blood circulation, helping blood get to where it needs to go. This sunny and bright essential oil is great for treating bulging veins. Lemongrass essential oil encourages blood circulation, inhibiting blood from pooling and becoming stagnant. This healing essential oil also keeps veins healthy and strong by keeping the blood vessels dilated, providing smooth transportation of blood. This floral essential oil is a woman’s best friend. Keep clary sage essential oil to treat symptoms of menopause and PMS and most importantly, varicose veins. This healing essential oil decreases swelling of the veins while inhibiting blood from pooling in the veins. Geranium essential oil fixes a lot of cosmetic problems such as treating acne and stimulating hair growth. However, that’s not all! Keep this essential oil in your beauty arsenal to treat and prevent varicose veins. Geranium essential oil boosts blood circulation and decreases unsightly swelling. On top of helping to heal your varicose veins, geranium essential oil will go the extra mile and ensure that your skin on top of the veins remains smooth and flawless. The tart nature of lemon is known for its astringent properties. This is also true for lemon essential oil. By applying lemon essential oil to your varicose veins, you will not only prevent proper blood circulation, but will also help tighten the vein walls. It is important to keep your veins healthy and tight in order to promote healthy circulation. Yarrow essential oil is another oil every woman should keep in her medicine cabinet. This relaxing essential oil helps regulate irregular periods and alleviates burdensome symptoms of menopause. In terms of varicose veins, yarrow essential oil stimulates the circulatory system. This ensures that blood does not pool in the veins, causing them to bulge and twist. Frankincense essential oil is fantastic for vein support. This healing essential oil boosts circulation, making sure blood doesn’t take up residence in the veins of your lower extremities. Use frankincense essential oil to not only promote healthy circulation, but also to promote strong veins that are resistant to bulging and twisting. Massage Oil: Get the blood circulation flowing by massaging your affected veins with healing essential oils.• Mix a couple drops of an essential oil with a carrier oil and massage the affected area upward towards the heart. • Do this treatment twice a day, daily. Compress: Alternate with a warm and cool compress to reduce the appearance and pain associated with varicose veins. Cool and warm compresses encourage blood circulation and reduce swelling and inflammation.To make a compress, soak a clean cloth in either warm or cool water and wring out the excess moisture.• Apply five drops of essential oil and apply the compress directly to the affected area. • Elevate your legs for 15 minutes. • Try this home remedy twice a day, daily. Warm Bath: To soothe achy muscles and veins and to get your circulation going, consider taking a healing bath with essential oils. Add drops of essential oils to your bath and soak for 20 minutes. To ensure your varicose veins don’t come back or to prevent them from occurring in the first place, there are several preventative measures you can take. 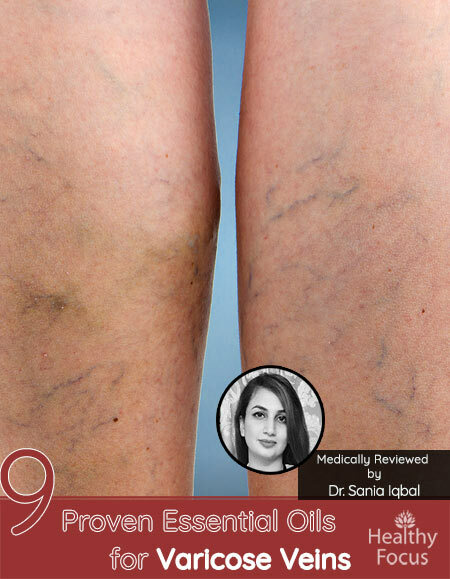 These preventative measures also prevent the development of spider veins as well. Avoid long periods of standing or sitting, which may inhibit blood circulation. Drink plenty of water. Eight to ten glasses a day is typically recommended for your overall health. Avoid wearing constricting clothing. When wearing pantyhose, make sure to wear support hose. Elevate legs when sleeping or resting. Be mindful of your diet. Consuming an excessive amount of alcohol and spicy foods may contribute to the development of varicose veins. Diets rich in garlic, fiber, and vitamins C and E is recommended. To increase blood circulation, get enough exercise and watch your weight. As if constipation wasn’t unpleasant enough, it may also have another awful side effect, such as varicose veins. To prevent constipation and by proxy, varicose veins, adjust your diet accordingly. Speak with your physician and add more fiber to your diet. For even more home remedy vein treatment options read home remedies for spider veins. Always check with your physician before using essential oils to treat your varicose veins. Especially if you suffer from high blood pressure and skin allergies. Some essential oils may not be suitable for the use of pregnant women or women who are breastfeeding. 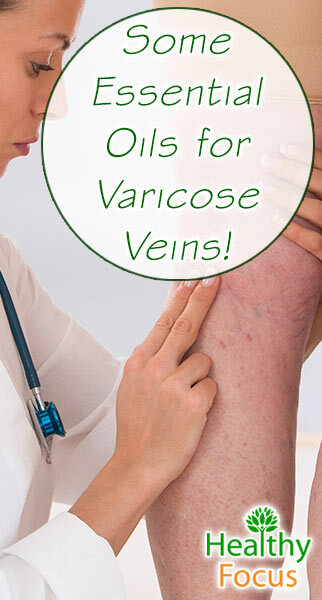 Consult with your physician to see if essential oils are a suitable treatment option for your varicose veins. Always dilute essential oils with a carrier oil before applying directly to the skin. In the case of treating varicose veins, jojoba oil and avocado oil is your best bet. These oils penetrate deep into your skin, stimulate the growth of collagen (essential for maintaining supple, flexible veins), and prevent inflammation. When purchasing essential oils, make sure you are choosing 100% organic, therapeutic grade essential oils. Essential oils sold at a discount price may contain fillers and contaminants, which not only cuts down on the effectiveness of the oil, but also may be harmful to your health. In the case of essential oils, you typically get what you pay for.